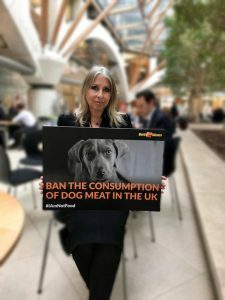 Co-Founder of the Conservative Animal Welfare Foundation Lorraine Platt joins campaign to ban the human consumption of dog meat in the UK. Lorraine Platt met with representatives from the World Dog Alliance (WDA) – an international animal welfare charity – on the 9th January to discuss their campaign to ban the human consumption of dog meat in the UK. The WDA are calling on the government to pass legislation that will uphold the UK’s position as a global leader in animal welfare. Whilst laws in the UK ban the commercial trading of dog meat, and the slaughter of dogs in abattoirs, it is still legal to eat dogs in our country. Internationally, 30 million dogs are killed for their meat every year. It is estimated that 70% are stolen pets. These animals are often subjected to extremely cruel practices for their meat – many being tortured, skinned and boiled alive. The WDA are calling for a full ban to send an unequivocal message that this despicable act is not welcome in the UK or anywhere around the world. A ban here will send a powerful signal to encourage other nations, where dogs are eaten, to introduce a ban. In December 2018, the USA banned the human consumption of dog and cat meat in the Farm Bill. This ban was passed even though eating dogs is clearly not an issue in the US. The US passed the ban to explicitly demonstrate that eating dogs is not acceptable and to show unity with other nations that have a ban. It is now time for the UK government to follow suit. The USA joins other counties and regions around the world in banning the disturbing practice, including: Germany, Austria, Taiwan and Hong Kong and South Australia. The UK campaign, championed by a cross-party team of MPs, has been featured in BBC Politics Online, The Sun and iNews. It is now time to urge the UK government to follow the USA in banning the consumption of dog meat and maintain its place as a global leader in animal welfare. We have called for a UK Ban on the consumption of dog meat in two letters to the Secretary of State in January and February 2019. Giles Watling MP has tabled an amendment to the Agriculture Bill for a ban. Bill Wiggin MP will lead a 10 Minute Rule Bill ( Dog Meat Consumption Offences) on Tuesday 19 February. Jim Shannon MP has a Westminster Hall debate’ Banning the consumption of dog meat in the UK) on Thursday 21st Feb at 3pm. We ask MPs to attend and support these important events.